Armenians Decry Erdogan's Gallipoli Celebration as a "Provocation"
of the Armenian Genocide, perpetrated by the Ottoman Turks. invitation as "the dishonest action of an ill-mannered person." the centennial of the genocide. rounded up, arrested, and later executed. publicly recognize and denounce the genocide. the questionable role of Turkey in World War I and World War II,"
universal memory but never on selective approach." land battle--took place on April 25, 1915.
to the centennial of the Armenian Genocide?" he asks. startling steps advancing the 100th anniversary of Armenian Genocide. realizing the program of total annihilation of the Armenians. thousands Armenian conscripts survived in the end of the WW I.
attempt of destroying the memory of the Armenian people. rights, and prevention of new genocides. in a simple and unvarnished way. gunned down in the streets of Istanbul, Turkey on the same day on 2007.
frozen history in 1915 is to break taboos,' according to Davutoglu. attention away from, and deny the Armenian Genocide. country ahead of the April 24 Genocide centennial. considering the goal absolutely obvious. serious text on any issue, they just try to ignore it," he noted. policy as Turkey's common conduct. Armenians and Turks fought shoulder to shoulder during the battle. that is doomed to failure," he added. Turkish PM Davutolgu's offer of a "New Beginning with Armenia"
Ahmet Davutoglu (Turkish PM): OK. Armenians. Do I have your attention? To start, I did, in fact, kill half your family. Tortured some. Raped others. Sure. I burned down your house. It's true. I stole all you owned and drove you into the street. Yes. I've lied about my crime. Told people it was your fault. I've bribed the cops to stay away. I've bullied the neighbors into silence. And it's all worked rather well. You could say I committed the perfect crime. There's one thing though that's still bothering me, and that's you. You, and your complaining and your endless claims. You won't calm down and you won't give up. Now. Let's be clear about this. I won't be giving up anything I stole. then, see, we can be friends. You can't even fool a two years old with this blatant lie! Messages from Turkish President Recep Tayyip Erdogan last year and Prime Minister Ahmet Davutoglu on Jan. 20 addressed to Armenians were not “tactical” steps taken for the 100th anniversary of the 1915 events, Turkish Foreign Ministry spokesperson Tanju Bilgic has said,Hurriyet Daily News reported. “Those statements have sincere and functional dimensions. They represent a conscientious stance and a humane perspective,” Bilgic told reporters on Jan. 21. Ahmet Davutoglu's message to the Armenian people. light of 800-year-long common history." official Turkey's empty calls for Armenian-Turkish rapprochement. economic blockade of Armenia has been Turkey's priority in all times. stereotypes, building confidence and developing cooperation. marking the centenary of the Battle of Gallipoli in Canakkale. of International and Security Affairs (AIISA), told Tert.am. letters must be sent out to world leaders, showing Turkey's conduct. 100 years after the Armenian Genocide. This is the question," he said. and not new at all. "It is not the first such message," he said. will not be resolved," Mr Saroyan said. present-day foreign policy is aimed at the Armenian Diaspora. format is needed in dealing with the latter. ANKARA—A leading Turkish opposition figure has claimed that the government is preparing to offer some land to Armenians as the 100th anniversary of the Armenian Genocide approaches, Today’s Zaman reports. “I know the AKP [ruling Justice and Development (AK) Party] has an ongoing project [on the issue]. A professor has been advising and working on the transfer of land to Armenians who will be brought to Turkey,” Oktay Vural, deputy chairman of the Nationalist Movement Party (MHP), told Today’s Zaman. Noting that the Armenian diaspora has legal claims on lands, and citing recent law suits over lands at the former presidential residence in Ankara and some land in Istanbul’s Yeşilköy district, Vural demanded to know if it was a coincidence that the government earlier said the Istanbul Atatürk Airport in the city’s Yeşilköy district would be removed. The former presidential residence, known as Çankaya presidential palace, was in service until President Recep Tayyip Erdoğan was elected president in August last year. Erdoğan lives instead in a recently built presidential palace, while the former presidential residence will be, as Erdoğan said, allocated to the Prime Ministry. A large majority of historians and scholars, as well as more than 20 countries and 41 states in the US, have recognized the Armenian Genocide of 1915, the one hundredth anniversary of which is this year. “Such an attitude would render Turks into being slaves on their own land,” Vural maintained. “Are we going to retry history by legitimizing the demands of those who ask for Çankaya presidential palace and the Atatürk airport in Yeşilköy? What will the AK Party say if some others demand to have Istanbul back saying it used to be called Constantinople?” Vural said. Noting that some Turkish foundations used to have properties in Cyprus, which used to be part of the Ottoman Empire, Vural demanded to know if the government would make a claim on those properties together with those in the same category in Palestine, ironically ignoring the fact that the Republic of Turkey, in fact, currently occupies about half of Cyprus. Museum Institute Hayk Demoyan told reporters today. to check the medical history of the Turkish officials. anniversary of Hrant Dink's assassination. the immediate complications of the disease," Demoyan said. Over the past 5-6 years, the Turkish authorities had a good opportunity to ratify the Armenian-Turkish protocols, Armenian Foreign Minister Edward Nalbandian told reporters on Monday. “Unfortunately, they failed to get rid of their internal taboos and missed no chance to deny the Armenian Genocide and, to put it mildly, make unfriendly statements and actions for the Armenian people and Armenia,” he said, commenting on Turkish Prime Minister Ahmet Davutoglu’s recent statement on the 8th anniversary of Hrant Dink’s assassination. In Nalbandian’s words, a question arises: why did Ahmet Davutoglu and other senior Turkish officials wait until 2015 to make a statement on Hrant Dink’s assassination and how can one explain the fact that over eight years the Turkish authorities failed to find those guilty of Dink’s murder? “That statement has nothing new and an answer to it has already been given,” Mr Nalbandian said. day coinciding with the Armenian Genocide centennial. Erdogan is inviting Armenian President Serzh Sargsyan to Canakkale,"
Bakin Oran said in an article published in Radikal. without receiving an answer to our own invitation". According to Prime Minster David Cameron, a national service of commemoration at the Cenotaph in London on Anzac Day, 25 April, 2015, will be a high-profile UK-Led event arranged in co-operation with the governments of Australia and New Zealand, who have held a ceremony there on that date for the last 98 years. Unsurprisingly, the prime minister's announcement also includes a UK-led Commonwealth and Ireland ceremony at the Commonwealth War Graves Commission Helles Memorial in Turkey on 24 April, 2015, the eve of the Gallipoli landings. The Prince of Wales will be leading the UK delegation. But the year 2015 also marks the Centennial of the Armenian Genocide, the first genocide of the 20th century, organised and perpetrated throughout different regions of the Ottoman Empire by the government of the Young Turks in 1915 during the course of World War I.
Armenian people across the world have been commemorating the Armenian Genocide on 24 April every year. The British Armenian Community has petitioned Downing Street every year calling for official recognition of the veracity of the Armenian Genocide by the government in the UK, urging our successive prime ministers to stop the denial of the first genocide of 20th Century and complying with Turkey's policy of unjust denial. In a blatant act of denial, Turkey's president Recep Tayyip Edogan invited Armenian President Serzh Sargsyan to ceremonies marking the Centenary of the Battle of Gallipoli in Çanakkale on 24 April 2015, which coincides with the Armenian Genocide Remembrance Day. This is the first time that the Battle of Gallipoli will be commemorated on 24 April. President Sargsyan rebuffed Erdogan's invitation by reminding Erdogan of the invitation handed to him in person several months ago for the events to be held in Yerevan, Armenia on 24 April, 2015 to mark the Centenary of the mass killing of Armenians across Ottoman Empire, to which the Turkish president has not ever responded. Genocide scholars agree that 70% of the Armenian population, roughly 1.5 million, were killed mercilessly or fell victim to starvation and illness during the forced deportations. Massacres and deportations continued throughout 1916 and occurred with lesser intensity until 1923. In an open letter addressed to Turkey's Prime Minster in 2005, the International Association of Genocide Scholars invited Turkey to face its history and officially recognise the Armenian Genocide. Since 1965 over 20 countries and international bodies, including Germany, Canada, France and Italy have recognised the veracity of the Armenian Genocide. Turkey and its allies remain adamant by denying the historical validity of the Armenian Genocide. The UK, USA and Israel's governments fail to realise that by supporting Turkey's policy of denial, they promote injustice. In the case of the British government, they deny their own history by forgetting the fact that in the course of World War One the British government revealed the truth about the genocidal fate of the Armenians. So why, 100 years on, does today's British government refuse to acknowledge that truth? The first phase of the massacres and forced deportations of Armenians began with the arrest, confinement and murder of 1,000 Armenian community leaders, doctors, lawyers, merchants, pharmacists and teachers in Constantinople, modern-day Istanbul, capital of Ottoman Turkey, on 24 April 1915. This date is therefore significant and commemorative for Armenians across the globe. Given the recent changes in Turkey and following the assassination of the Turkish Armenian journalist Hrant Dink, the Armenian Genocide is commemorated in Turkey every year. Turkish intellectuals openly address the subject, inviting their government to change their policy of denial. The Turkish government should realise that after 100 years of denial, it is time to acknowledge their past and accept that millions of Armenians and other Christians fell victim to their 'relocation' policy of Christian minorities. By acknowledging the truth, they will pave the way for Turkey's democratisation and progress bringing the country closer to European values. Accusing Turkey of committing genocide is a form of execution without trial, President Recep Tayyip Erdogan has indicated, while also stating that Ankara is “ready to pay for any misdeed” if an “impartial board of historians” concludes that it was at fault for the events of 1915, Hurriyet Daily News reports. “We are not obliged to accept that the so-called Armenian genocide was ‘made-to-order,’” Erdogan said late on Jan. 29, speaking during a live interview on public broadcaster TRT Haber. “We are saying, ‘If you are sincere on this matter, then come, let’s leave this to historians, let historians study the issue, let’s open our archives,’” Erdogan said. Centennial of the Armenian Genocide. victory in the Gallipoli Battle. by their predecessors," the Armenian President said. European Convention on Human Rights. Genocide denial is a possible signal for reoccurrence of such crimes. could be present at the ECHR's session. the hearings as third parties. The website of Turkish newspaper Hurriyet touched upon the statement Armenian President Serzh Sargsyan made at the 5th session of the State Commission on Coordination of the events for the commemoration of the 100th anniversary of the Armenian Genocide. Referring to the statement, Hurriyet said that the Armenian President rebuffed Erdogan’s invitation one more time. The website noted that such steps by Turkey are evidence of not only its political weakness, but also its desire to avoid legal accountability. be marking the centennial of the Genocide committed in Ottoman Turkey. 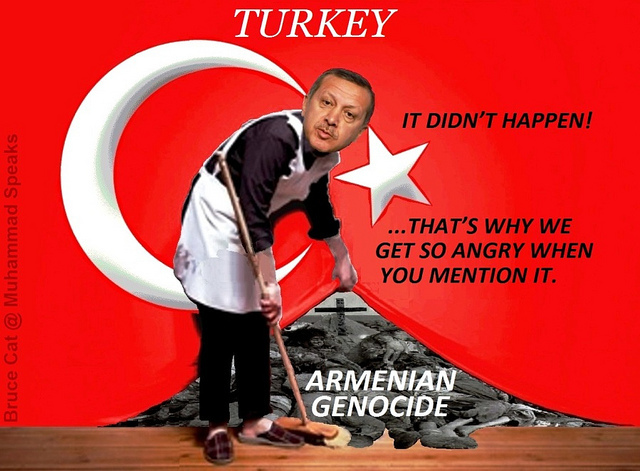 official Ankara offered a bad service to itself in this matter,"
anniversary of the Armenian Genocide. president, to come to Turkey for the massive ceremonies. 24. The Armenian president also called the Turkish move a "primitive"
communal and pan-Armenian rights and legitimate interests." history and past" by ending its long-running denial of the genocide. character of the 1915 mass killings and deportations of Armenians. anniversary of Armenian Genocide mentions future generations. international struggle and the way the Armenian people is passing. of Armenian genocide. He point out rapid developments. Armenian Genocide, Ermenihaber.am reports citing Ulusalkanal.com.tr.